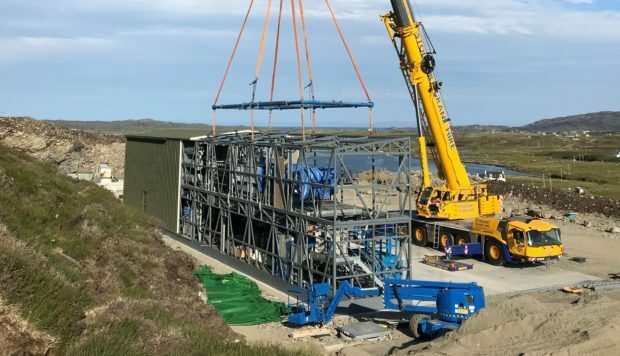 As part of a £15 million project to deliver a new water treatment facility to North Uist and Berneray, the modules have been delivered on time, keeping in line with the schedule of works. The project as a whole is expected to bring a reliable water supply to residents and visitors to the islands. The modules were designed and manufactured in Muir of Ord by Ross-Shire Engineering, where they underwent rigorous testing methods. Scottish Water project manager, Anoushka Ainslie-McAlpine, said: “We’re very pleased that these deliveries have gone smoothly and would like to thank other road and ferry users for their patience while they were taking place. Councillor Uisdean Robertson said: “Everything is coming together; two lorries have been transporting several loads which have been prefabricated and are now being assembled on site. “It is a welcome sight to see the modules being assembled on site and Scottish Water have kept us well informed throughout the project as to what is going on.